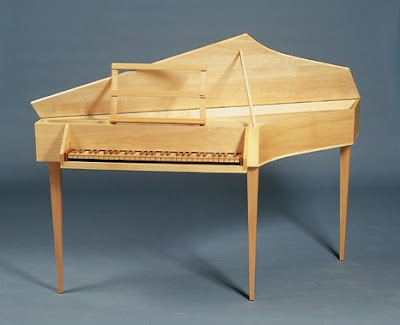 The spinet is closely related to the harpsichord, both in construction and sound; it is smaller, cheaper to build and is limited to a single keyboard and one string per note. The oldest surviving spinets are Italian, from around 1610. The 'bentside spinet' seems to have been developed by the Italian Girolamo Zenti in the 1630s. It became popular throughout Europe and especially in England, where from about the 1680s it rapidly replaced the larger, rectangular (and 'plummier' sounding) virginals. The instrument used by Rare Byrds is based on one built in 1770 by the Belgian Albertus Delin; the original is in the Brussels Museum. It has been assembled from a kitset designed and made by Marc Ducornet of The Paris Workshop. The case, like the original, is of poplar, sealed with linseed oil. The keys are covered in maple, with the sharps and flats in cherry wood. The 3mm-thick soundboard is spruce, sealed with shellac. Oak and beech are used where hardwoods are necessary. The strings are of red brass, yellow brass and very mild steel coated with tin; they replicate the types of string traditionally used. Each string is plucked by a tiny 'plectrum' made of a very precisely shaped piece of special plastic (originally the quill of a crow's feather was used). The plectrum sits in the 'tongue' of a wooden 'jack', which is pushed up when a key is depressed by a finger. The instrument is currently tuned to a 'temperament' believed by some scholars to have been that normally used by J S Bach.